That little green box you're looking at? It's the invention of a 26-year-old whiz kid by the name of George Hotz, who made a name for himself in 2007 when he became the first person to hack the iPhone. 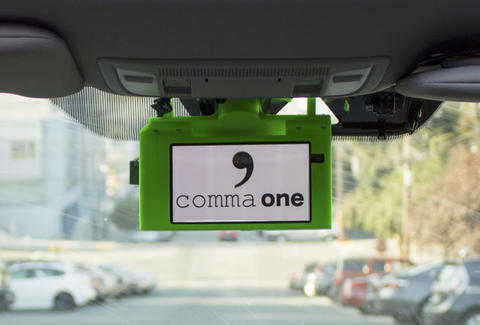 It's called the Comma One, and it makes your car semi-autonomous for just $1,000, plus a $24 monthly subscription fee. With a couple of caveats. Should you buy one? Oh good Lord, no. As Tesla comes under intense scrutiny for prematurely unleashing Autopilot technology that drivers don’t quite know how to handle yet, autonomy you buy in a freaking box is way too much, way too soon. So, the first caveat: as of right now, Comma One only works with select Hondas and Acuras that feature lane-keeping assist. That said, what it does is actually kinda brilliant. It uses a built-in camera, along with the sensors and controls already built into the car, to form a radar- and camera-based understanding of the surrounding environment, and to maneuver the car as it deems appropriate. Because of that, the cost of hardware is relatively low, and Comma One can rightly claim an offering that functions loosely in the same manner as Tesla's Autopilot. It's an impressive opening salvo by Hotz. But that's about all it is. By his own admission (see above video) Hotz doesn't like Mobileye, a hugely important company you've probably never heard of. It's the firm that makes all the hardware used by most major manufacturers to develop their self-driving technologies. It's relevant to point out that Hotz was in negotiations with Musk to work on Tesla's next-generation Autopilot system around the same time that Mobileye severed its development partnership with Tesla. The rationale for the divorce? Mobileye believes Tesla's intended speed of advancement wasn't keeping with best practices regarding the safe rollout of self-driving tech. Musk and Hotz are of like mind here, believing that any autonomous advancement -- however unpolished and imperfect it may be -- is a net gain for society. Pushing these products towards a public that lacks the capacity to fully comprehend what it does, however, simply invites misuse and ultimately impacts those who would much rather wait for the fully engineered and refined systems that major automakers have been developing for over a decade. Use of the Comma One, just as with Tesla's Autopilot, comes with a warning that it's not a fully autonomous system, and that the driver should remain aware of his or her surroundings at all times. Just one problem: the product is being presented as a completely hands-free solution, which is a step beyond even Musk's laissez-fair approach to Autopilot use -- which itself is enough to flood YouTube with examples of unwitting non-drivers misusing the tech. Hotz wants everyone to know that if Tesla is "the iOS of self-driving cars, we want to be Android." That's a nicely-crafted five second soundbite that carries with it no real meaning or even a positive connotation. Tesla's Autopilot has come under intense scrutiny not only from other automakers, but the government, too. Why? Because the software oversteps the intended boundaries of the hardware on which it operates, boundaries to which that hardware was specifically engineered. Using the Honda sensors as Comma One does essentially follows that same path. Further, updating products on the fly -- products which are relied upon (however incorrectly) to handle safety-critical functions -- can be interpreted as a sign of inadequate testing, and raises legitimate ethical concerns about the company's treatment of the public as beta testers, and again this is part of the Comma One plan. To be clear, Comma One does not represent a doom and gloom scenario, but it also offers very little benefit and more risk than the company would have you believe. If a driver is texting, for example, or generally displaying a lack of attention to the road, then yes, Comma One is clearly a safer option. Then again, the aforementioned mountain of anecdotal evidence on YouTube suggests a very clear pattern that reliance on systems such as this truly encourages inattention -- and the Comma One doesn't even require a periodic and symbolic touching of the steering wheel to remain active. Will the Comma One give your car an Autopilot-like system for under a grand? If you have the specific cars on which it works, yes. Is it a smart buy? Absolutely not. Aaron Miller is the Cars editor for Thrillist, and can be found on Twitter and Facebook. He's all for advancements in automotive technology that are based on comprehensive research and engineered with an analytical approach. While he applauds entrepreneurial spirit, he considers this a premature marketable good, not a technological achievement.